Whether you blog professionally, guest post as part of your freelance work or blog as part of your author marketing strategy, being able to write a good blog post is a skill that is useful for all writers to have. 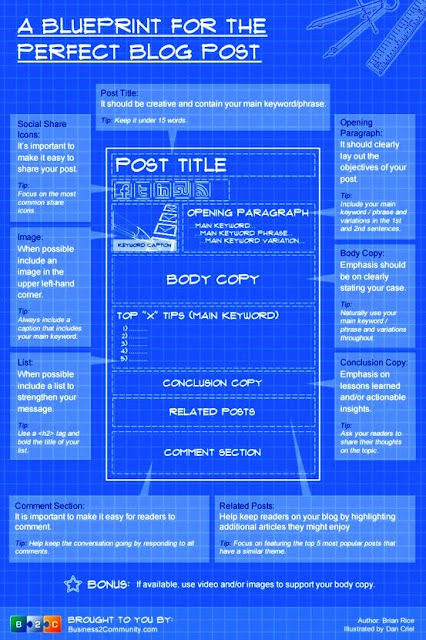 This infographic A Blueprint for the Perfect Blog Post gives a nice breakdown of the main factors involved in creating a good blog post. Giving easy to follow, step by step instructions on how to construct a blog post, it will be a useful resource for you all to refer back to. Use keywords to optimise the post for S.E.O. The post should have an introduction, a body and a conclusion. Make it easy for readers to comment. Make is easy for readers to share the content. So there you have it. A frame to work with when you write your next blog post to help you build it for success. Give it a try and let us know if you saw a difference in the results of that post compared to other structures you've used in the past. Did you get more traffic? More comments? If you'd like a more in depth look at the points covered in the infographic check out the original post in which it appeared on Business2community.com. Just wanted to say I love this post, and I look at it now, every time I want to publish a new post. Glad you like it :) Thanks for taking the time to comment. If I break all these rules, am I a rebel without a clause? Thank's Bryan. Glad you enjoyed it.